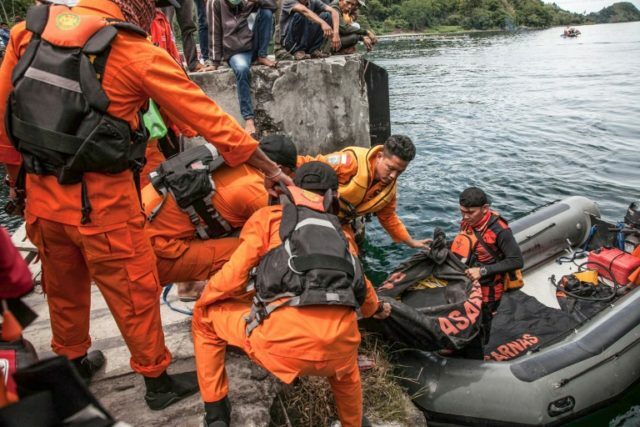 Simalungun (Indonesia) (AFP) – The captain of an overloaded Indonesian ferry that sank into the depths of a volcanic lake has been detained by police for questioning over the deadly disaster, authorities said Thursday. Identified as Tua Sagala, the captain was among just 18 people rescued after the vessel capsized and sank Monday afternoon on Sumatra’s Lake Toba, a popular tourist destination. Four passengers were previously confirmed dead, but the search-and-rescue agency on Thursday revised that figure down to three. Official estimates list 193 people missing as of Thursday morning, raising fears that the incident could become one of Indonesia’s deadliest ferry disasters. The traditional wooden boat is believed to have been operating illegally with no manifest or passenger tickets. Official estimates of the number of passengers are based on reports from families whose missing relatives may have been on the doomed vessel, but their accounts are difficult to verify. If confirmed, the boat — which was also carrying dozens of motorcycles — may have been jammed with four or fives times the number of passengers it was built to hold. The ship’s captain is also the owner of the vessel, police said. “The captain of the boat is now with the police,” national police spokesman Yusri Yunus told AFP Thursday. Top government officials including the transport minister and national police chief were expected to arrive at the scene later Thursday. The rescue operation has now turned to recovering bodies — including those that may still be trapped inside the sunken boat. Authorities have deployed divers and underwater vehicles, along with about 400 personnel, to search one of the world’s deepest lakes. The lake, popular with international and domestic tourists, fills the crater of a supervolcano that exploded in a massive eruption tens of thousands of years ago. The disaster came just days after more than a dozen people were killed in an unrelated ferry accident in the Southeast Asian archipelago nation, where many people depend on boats to get around. Traditional vessels — like the one in the Lake Toba disaster — are often packed beyond capacity. They are rarely equipped with enough life preservers and their condition can be dire.